How easy is it to communicate with social networks like Facebook? There is little question that the wild popularity of social networks comes from the fact that they solve a basic problem – ease of communication – in a way that is superior to previous options. 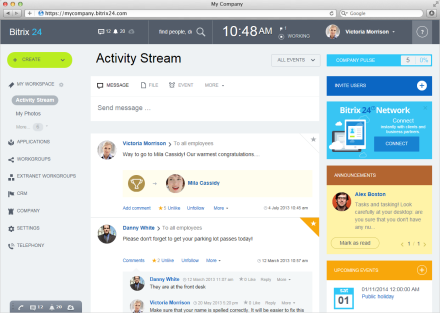 Imagine putting the power of enterprise social networking into your company's daily operations!Bitrix24 provides tools for task management, document sharing, and time tracking integrated into just this type of social interface for maximum efficiency of communications and work. 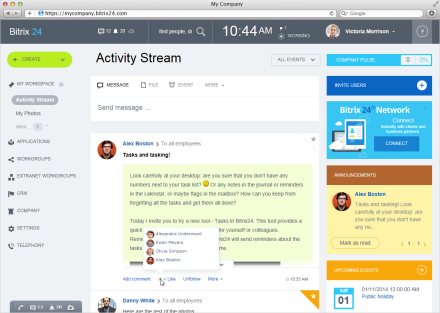 Use Bitrix24 in your office, or anywhere you like with the free mobile app! 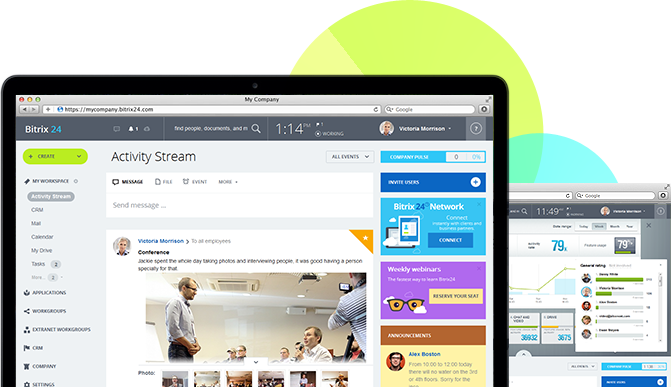 The Activity Stream is a unified, interactive update feed where all the changes and new additions to the intranet can be seen. 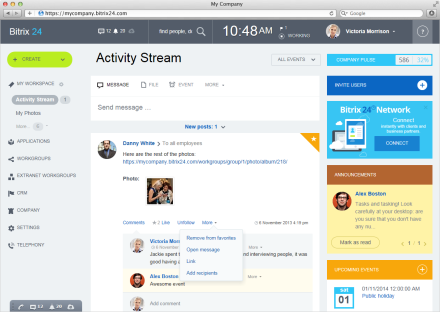 The Activity Stream covers all production, social, and mixed-function sections of the intranet. 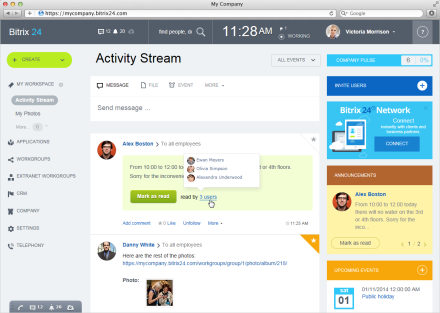 Each employee can stay aware of what is going on, contribute to discussions, and, importantly, choose what types of updates to display, because the Activity Stream can be personalized by each user.Bitrix24's Activity Stream provides users with real time updates, smart following, notification settings, and company-wide announcements. 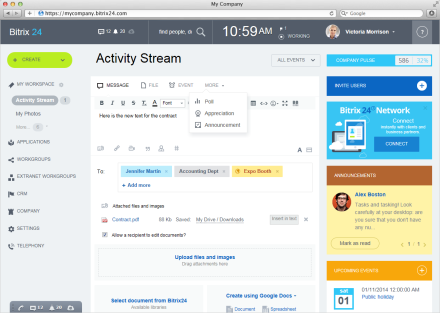 You can schedule events, attach files, receive immediate feedback from your colleagues - all done inside your personalized Activity Stream. Aside from being personalized, the Activity Stream is interactive. Comments can be directly from the main interface, the task and photograph viewer can be brought up without additional navigation, and items can be 'liked'.Liking content shows the opinions of coworkers and also influences search results, as liked content is shown with priority in search results. In this way, useful and popular content remains easy to find. Conversations are an easy way to start collaboration on a task or a document. When starting a new conversation in the Activity Stream, you can also attach a document or an image.You can start a private conversation with one or many colleagues, adding additional participants at any time. Private messages can also be sent through the Instant Messenger. Don't miss important announcements! If you want to make sure that everyone sees an important announcement, click the Announcement message type in the Activity Stream.Announcements are shown in the light yellow block in the top right corner of the main page. Announcements remain visible to users until they mark them as read. The photo gallery gives users complete control over photo albums. The company can have any number of photo albums, and each user and workgroup can, as well. Upload files quickly with the convenient bulk loader, like photos, and add comments. The photo gallery is tightly integrated with the Activity Stream, where thumbnails of new photos automatically appear and can be 'liked', viewed, and commented on. The photo viewer appears 'above' the Activity Stream without navigation. Standard workflows (Leave Requests, Business Trips, Expenses, Purchases, General Requests) are included free of charge in all Bitrix24 plans. 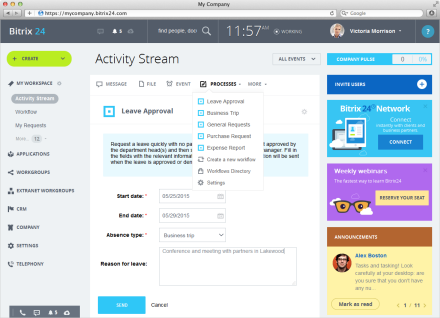 Any time your employees need to ask for leave, submit expenses, request technical assistance or put a purchase request in, they can do it via Activity Stream. All workflow updates will be posted to Activity Stream as well.